In 8 Questions, 8 80 Cities asks amazing partners we’ve worked with, or amazing people doing amazing work, 8 questions about their passions, their history, and their amazing-ness. Our inaugural interviewee, Al Bangoura is the Recreation Superintendent of Mecklenburg County Parks & Recreation. We’ve had the pleasure of working with Al in his role as one of three Managing Directors of Open Streets 704, Charlotte NC’s local open streets program. We’ve been working with Open Streets 704 on creating a roadmap for their program to expand its reach and scope. We spoke with Al about his vision for Open Streets 704, the terrifying feeling he gets five minutes before open streets begins, and the power of cinematography. How long have you worked with the Mecklenburg Parks and Recreation Department? Al: This March will be my third year at Mecklenburg Parks and Recreation, and my fourth in Charlotte. Prior to that, I worked and lived in Minneapolis MN, also in the Parks and Rec department. The only reason I’m in Charlotte is because my wife got a great professional opportunity here. I wanted to support her and her career, so we met that fork in the road, I left my position in Minneapolis and followed her out here with our son. A year later, I landed almost the exact same position that I had in Minneapolis in Charlotte, so it was meant to be. 8 80 Cities: Have you found the culture of the parks departments in Charlotte vs Minneapolis to be really different? Al: When you look at Parks and Rec departments, you have people who are really passionate and love the work they do. I’ve found that to be true across every place and Parks and Rec department I’ve visited. The work is the work. 8 80 Cities: What’s your single favourite thing about the work? Al: There’s an academic side to the work that’s fundamental to being a recreational professional. But the really fun stuff is the creative side, where you can create your space. I can say ‘Today, I want to build a design and technology lab for youth. How are we going to get there?” And then you just go for it! I think of it as being the architect for a community. A recreation centre is sometimes the only place communities have to access green space and programs and leisure and athletics. It’s everything. When did you first hear about the open streets concept? Al:I heard about it Minneapolis. I was contacted by Open Streets Minneapolis, who said they wanted me to be part of their open streets program. And I said, ‘Sure. What is open streets?’ I had no idea what it was, but I just got involved because I have this personality where I always think “Why not? I should do it’, even if I don’t know what the ‘it’ is! What really hooked me was the idea that we’re turning streets into parks. That’s amazing right? So, I started going to meetings and heard Gil Penalosa (8 80 Cities’founder) speak about the Bogota Ciclovia and I got more deeply involved and loved it. So of course, when I got to Charlotte, and my Director at the time, Jim Garges, said in a meeting we should do open streets here, I raised my hand and said ‘I love open streets, I worked on it in Minneapolis’ and he said ‘Well guess what, you’re going to make it happen in Charlotte’. And that’s how I get involved with what would become Open Streets 704. What about open streets made you want to work on it? Al: The unique thing about open streets is how it layers and bridges so many different things. If you think about economic impacts, if you’ve got a business that people haven’t recognized before because they’re driving by in cars really fast through their neighbourhoods, they don’t realize there’s a business right there in their own community. They only discover it at open streets. Another layer is advocating for parks, or talking about environmental education, air quality, walkability, livability, social equity! Open streets hits all those things. Social equity is a big one for me. Connecting neighbors in a way that’s so organic and easy; it’s not forced. Walk, run, rollerblade, or whatever, it’s just natural. And people connect in a natural way. They slow down in an easy comfortable way, and open streets enables that. 8 80 Cities: I never really thought about open streets slowing people down, but you’re completely right. Al: We’re always rushing around in our bubbles, and open streets breaks through that. It slows you down and lets people connect. I’ve watched kids connect to their neighbourhoods, and they learn new ways to get across town and be in their city. You smell things differently, see thing differently, hear things differently. It’s crazy. It awakens you in a way. You, Scott Curry, (Pedestrian Program Manager for the City of Charlotte) and Monica Holmes (Planning Coordinator and Urban Designer for the City of Charlotte) are the three General Managers of Open Streets 704. How did that come to be? Al:Scott, because of this role in pedestrian projects, fell perfectly into working on open streets. Monica has been for years advocating to bring open streets to Charlotte, even before I moved to Charlotte four years ago. So, when she heard this might be happening, and that we got some funds from the Knight Foundation, she dove head first in with us. And the three of us had an immediate synergy and passion and it just made sense. We ran with it. We started calling people and asking questions and doing research in best practices. We just ran with it together. 8 80 Cities:How did you settle on your first program route? Al: Honestly, we looked at the city and just said ‘What is going to be impactful’? We wanted to make sure the first time out that we would building energy and that we that would be visible. We wanted to make sure we were creating a presence in the city. 8 80 Cities: Can you describe the feeling you had five minutes before the start of your first program? Al: It was a good scary feeling. Does that make sense? You’re thinking of all the things that could go wrong. We were closing three miles of streets (to cars) in the heart of uptown. It was unheard of. I was nervous, my stomach was knotted up. We were standing there going ‘Is this actually going to happen?’ But once it started and I travelled the route, I realized I had never explored this area of the city without a car before, and the nerves went away, and I was enthralled. That good scary feeling right before the program starts hasn’t gone away though. It happens every time. What’s surprised you the most while working on Open Streets 704? Al: Surprised in a good way is how many people came together to be part of it. Often when you’re working on a project and people come together, you get the 80-20 rule. 80% of the work gets done by 20% of the people. I was surprised with Open Streets 704 by how many people stepped up and participated. I remember the first meetings we had, when Scott, Monica and I had presentations, and we were trying to act like we knew what we were doing, people just came to the table ready to work. What would you describe as the biggest obstacle Open Streets 704 has faced? Al:It’s difficult. Probably, the biggest challenge is showing value in the program. We need to articulate the value for sponsors and funders in a different way and talk about the many different layers open streets supports, the economic impact, the livability, the street design. Sometimes people just see the program as just the four hours itself, and don’t see all the different things open streets influences and impacts. It’s not just a one-day event, it’s a program. It inspires lasting change in the city and in people’s lives. Al: Exactly! People want data on the number of participants, the number of touches they can get with folks. But that’s not the only thing that matters. How do you quantify and share those human experiences? What have been the biggest successes of the program? Al:Probably the fact we received support from the Knight Foundation to launch the program. Being sponsored by Blue Cross Blue Shield of North Carolina was huge as well. Without them, we wouldn’t be here. That aside, the big success has been the people sitting at the table and what they were able to do together. People who never work together otherwise. Businesses, Health Care folks, bike stores, restaurants, the fire department, day camps, spiritual organizations, public and private interests. The energy and passion they’ve brought, I think is unique to Open Streets 704. Al: Yes! Now the the people I’ve met through this have become close friends. And my rolodex – that’s old school. I should probably say OneNote – is much larger now and they can help me to build Parks and Rec initiatives across the County. We all call each other when grants or initiatives come up. The positive impacts of Open Streets 704 are cascading to other projects. 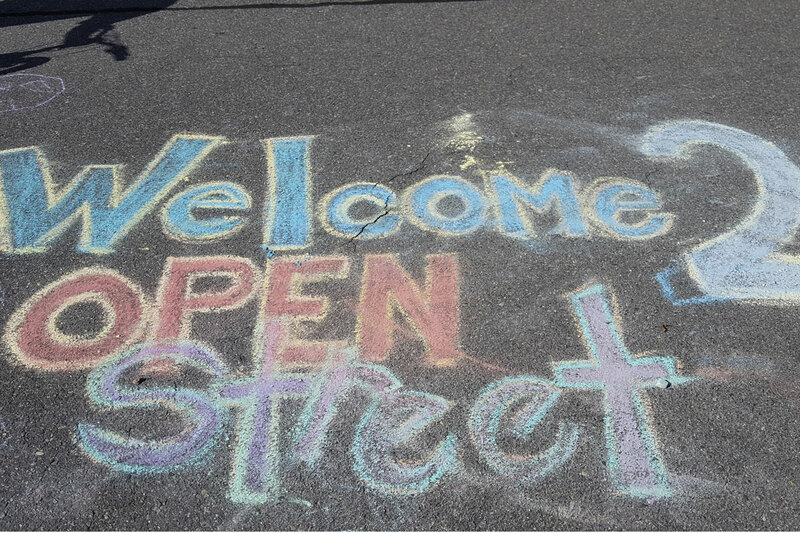 What is one lesson you’d want people working on open streets programs in other cities to take from Open Streets 704? Al:That’s a hard question. Honestly, I’d say ‘Have fun!’. I know that might be a simple answer, but I think you can get caught into the logistics and finances and different viewpoints and obstacles and struggles in making it successful. I think at the end of the day, if you love this program and have fun with it, I truly believe it will live and be sustained. 8 80 Cities: The website the A.V. Club has an interview format where the last question they ask is one their previous interviewee suggests. We’re going to shamelessly borrow that idea, but since you’re our inaugural interview, we’ve come up with the question. Al: Does this mean I need to come up with a question for your next interview? If you were to go back to school now, what would you study? Al:That’s a good question! This might sound strange, but I’ve always had a thing about being a cinematographer. I wanted to be the person on a movie set who captures a moment that truly moves people. That’s an incredible talent. If you’ve been to a movie where you’re weeping in the chair or moved beyond words, that’s powerful. And I think the travel would be great. Lord of the Rings, being in New Zealand. Like, wow that would be fantastic! 8 80 Cities: Ok, so what question should we ask the next person? Al: That’s hard. Hmmmm. What motivates you to get up every morning? What inspires you, what gives you purpose every morning? 8 80 Cities: That’s a great question. Thank you so much! Any last thoughts? Al: Open Streets is not an event. It’s a program. It’s every day living.